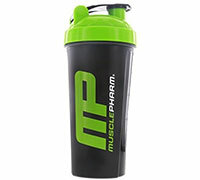 MusclePharm® Shaker Bottle- 25 oz. Blend your powdered supplements perfectly with the MusclePharm® shaker bottle. Ideal for taking your supplements on the go, this easy to use bottle ensures you are never without your supplements. You no longer have to worry about powdery clumps or leaky containers, this shaker has you covered!